The next great era will dawn sometime in the 22nd century, its outline shaped by a disruptive technology: “brain emulation”. In Isaac Asimov’s Prelude to Foundation book No. 1 of a seven-volume epic, Hari Seldon, a brilliant young researcher, employs mathematics to foretell the future of a gargantuan civilization that spans our home galaxy. Of course, that’s a science-fiction. But Robin Hanson, a professor of economics at George Mason University and scholar at Oxford’s Future of Humanity Institute, sets out to foretell the future of humanity, but not through the medium of a tale, but through hard-bitten academic research. History, so far, has been a series of three paradigm-shifting epochs: foraging (humans wandered the wilds in search of meat and roots and berries); farming (they stayed close to their local plants and animals), and; industry (they invented power-driven machinery that replaced handmade tools.) Per Hanson's calculations, the next great era will dawn sometime in the 22nd century, its outline shaped by a disruptive technology: “brain emulation”, which would enable an entire human brain to be converted from cells into circuits, and transfered onto a non-biological hardware. This, he foretells, will produce plenty of robots. Only, sadly, they’ll look nothing like C-3PO or the Roomba. He speculates that the early generations of intelligent artificial intelligence will be “ems”, entities, who aren’t human, but they will have feelings, like humans. In Flatland, a Victorian novella, published in 1884, Edwin A. Abbott tells the tale of a land of two dimensions, whose residents can’t envision a third dimension. The Age of Em, likewise, describes a world that’s as alien to us as we are to the fictional Flatlanders. 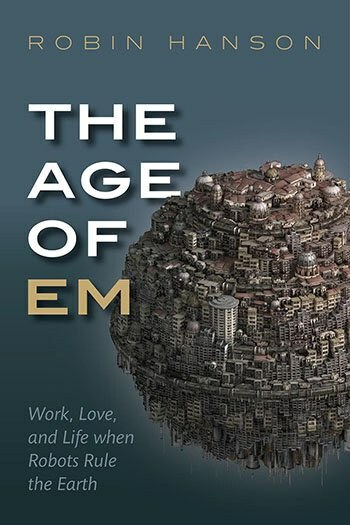 A mash-up of robotics and social theory, The Age of Em is a comprehensive treatise on what such a state could look like. Our progeny will be electronic beings, existing as a huge hive of “minds”, literally, one a mental clone of the other (to an extent.) Such an economy would double every month -- compared to the 15-year span required at the present -- “a growth driven less by innovation, and more by em population growth,” indeed, an explosive growth fueled by easy self-replication. One em would be able to make a phalanx of facsimiles of itself, on demand. In a world where an army of workers can be created at the drop of a hat, labor is woefully cheap, and wages fall far, dropping to subsistence level. Ems work more than half of their waking hours, but still earn just enough to make ends meets. (Sound familiar?) Instead of shelling out cash for mortgage, rent, grocery, gas, medical bills as we do today, ems would "pay" for their own infrastructure. Ems reproduce by making batches of identical copies of themselves, with identical memories and identical make-up. Perhaps the most troubling of all in this line of thought is the end of childhood as we know it. This tomorrow, as envisioned by Hanson, “weird” as it is, is rich with meaty data. But the forecast is limited only to the club of rich nations, avoiding any reference to the developing world. Neither does Hanson address how such a transition would be impacted by climate change. In the next 100 years, the environment might become much harsher -- and wetter -- forcing low-lying urban hubs to move to higher ground. Where does that leave humans? “Descendants of only a tiny fraction of humans dominate the new society,” those that are the smartest and the ablest -- some 500 of them perhaps. The rest of humankind, though materially better off, would be eclipsed, reduced to a life of the “retirees” of that world, existing on the periphery of em society. Most ems in that market would have the equivalent of desk jobs, requiring them to live and work in an immaterial world made of pixels and hex code, not atoms. Some tasks, though, will require contact with the outside world, where trees grow and rivers flow, such as running a nanofactory, the size of a desktop chassis; repairing a road; constructing a bridge; driving a car. As em minds are typically faster than human minds, em bodies are typically, smaller than human bodies. Most ems are Lilliputian-like creatures, with minds that can run at many different speeds, with the typical model (“kilo-em”) whirring away at 1,000 times that of human speed. A body that feels natural for such an em to control is only half as tall as a LEGO brick. To them, distances will, obviously, appear much, much greater. A physical commute across a city will take about 20 days (as compared to half an hour); a trip to Mars, a millennium in "em time" (as compared to eight months.) The clock will also appear to tick more slowly. A “day” will feel as long as nearly three years. Gravity will seem weaker to ems; the winds, stronger; the sunlight, dimmer -- ems will not be able to enjoy nature in all its glory. But on the bright side, small ems would possess capabilities that we humans don't possess, such as being able to run on water, wearing ordinary shoes. Where one Mary belongs to a community of other Marys, women just like her, it’s hard to see that such a society can be anything but egalitarian. Oddly, it too, this perceived future society is divided into classes that are grouped by speeds. Faster ems will belong to the higher echelons of society. Ems would live in in tall, dense skyscrapers, which are vast piles of computer hardware, threaded with cooling pipes, with clouds of hot air billowing from them. Such metropolises would emerge in regions that are cold, safe from storms, and close to a cheap source of cold water. Places much like where Google and Amazon have enormous server farms today, such as Norway.